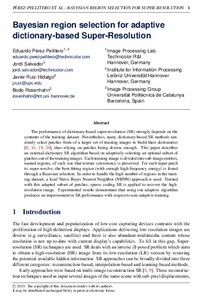 The performance of dictionary-based super-resolution (SR) strongly depends on the contents of the training dataset. Nevertheless, many dictionary-based SR methods randomly select patches from of a larger set of training images to build their dictionaries [ 8 , 14 , 19 , 20 ], thus relying on patches being diverse enough. This paper describes a dictionary building method for SR based on adaptively selecting an optimal subset of patches out of the training images. Each training image is divided into sub-image entities, named regions, of such a size that texture consistency is preserved and high-frequency (HF) energy is present. For each input patch to super-resolve, the best-fitting region is found through a Bayesian selection. In order to handle the high number of regions in the training dataset, a local Naive Bayes Nearest Neighbor (NBNN) approach is used. Trained with this adapted subset of patches, sparse coding SR is applied to recover the high-resolution image. Experimental results demonstrate that using our adaptive algo- rithm produces an improvement in SR performance with respect to non-adaptive training. The performance of dictionary-based super-resolution (SR) strongly depends on the contents of the training dataset. Nevertheless, many dictionary-based SR methods randomly select patches from of a larger set of training images to build their dictionaries, thus relying on patches being diverse enough. This paper describes an external-dictionary SR algorithm based on adaptively selecting an optimal subset of patches out of the training images. Each training image is divided into sub-image entities, named regions, of such size that texture consistency is preserved. For each input patch to super-resolve, the best-fitting region (with enough high-freqeuncy energy) is found through a Bayesian selection. In order to handle the high number of regions in the train- ing dataset, a local Naive Bayes Nearest Neighbor (NBNN) approach is used. Trained with this adapted subset of patches, sparse coding SR is applied to recover the high- resolution image. Experimental results demonstrate that using our adaptive algorithm produces an improvement in SR performance with respect to non-adaptive training. Pérez-Pellitero, E. [et al.]. Bayesian region selection for adaptive dictionary-based Super-Resolution. A: British Machine Vision Conference. "BMVC 2013: Proceedings of the 13th British Machine Vision Conference: 9-13 September 2013, Bristol University, UK". Bristol: 2013, p. 1-11.